If I tell you to imagine you’re at the British seaside, with the waves lapping at your feet and the sound of seagulls in the distance, then where do you think of? For millions of people across the country, that place is Blackpool. We’ve been people’s number one UK seaside destination since the days of black and white, when Laurel and Hardy trod the boards and mill workers hopped on a train at the weekend to enjoy all the top attractions that we had to offer. 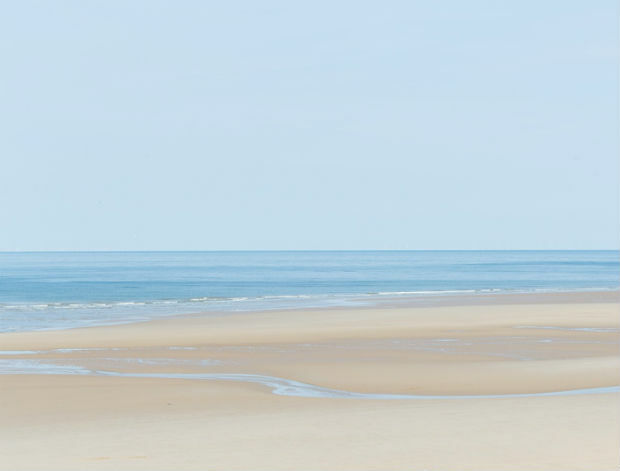 Roll on sixty years and the list of reasons to come to Blackpool still includes top class attractions, rollercoasters and candyfloss but the popular new resorts in Spain and Italy have had something that we couldn’t match until recently – a Blue Flag beach. 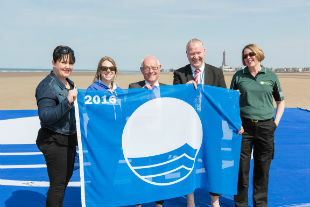 Not only does a Blue Flag mean the sands are kept clean but it means that the seas that people paddle and swim in are of a fantastic quality too. 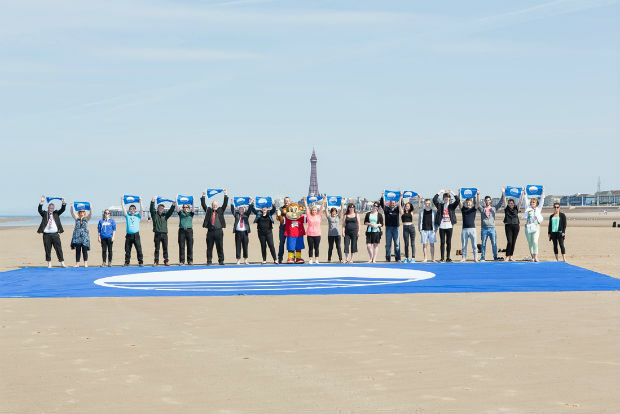 Five years ago, the idea of Blackpool being a Blue Flag resort was scoffed at. In fact, even keeping our sea water clean enough for people to swim in was a fight against the current. We’re surrounded by two rivers reaching into the Pennines, have much lower levels of bacteria killing UV rays than more southerly parts of Europe, as well as sandy beaches and a long coastal shelf - meant reaching the heights of the tough new water quality standards was a real uphill battle, with most experts predicting we would have to put signs up advising people not to swim in 2016. Having to put up those signs could have cost our local economy millions of pounds and for the most popular seaside resort in the UK that simply wasn’t an option. So five years ago we rolled up our trouser legs and set to work on making Blackpool’s seas as clean as possible. That included bringing together the water companies, the Environment Agency, National Farmers Union, Keep Britain Tidy, the Marine Conservation Society, Blackpool, Wyre and Fylde Councils, plus the local authorities up in Barrow and Allerdale, and key environmental groups for a vital summit on just how we could turn the tide. Blackpool partners improving water quality: Councillors, LOVEmyBEACH, United Utilities, Environment Agency. In the years that have passed, our partnerships (Turning Tides across the North West region and the Fylde Peninsula Water Management Partnership more locally) have worked tirelessly on reducing the impact of the lack of capacity in the sewerage system, farmland and urban run-off and many other aspects that could affect our sea water quality – including even donkeys and birds. Our north west water company, United Utilities, has invested more than £600m on schemes to capture and treat wastewater since the 1990s and is spending another £100m of infrastructure improvements at the moment. That includes giant stormwater storage tanks to reduce the risk of the sewers overflowing when there is very wet weather and extended outfall pipes that mean any overflows go over the coastal shelf into deep water and don’t come back on to the beach. At the same time, we’ve been working with our local communities, businesses and schools to teach them the importance of looking after the seas as they carry out their everyday work – whether that’s not pouring fish and chip grease down the drain, which can help clog up the sewers, or taking their staff out to do a beach clean. One spot in particular, opposite the famous Big One at the Pleasure Beach, is now able to boast having the ‘excellent’ quality water that allowed us to finally achieve that much sought after Blue Flag – the only one in the North West! At the same time, we now also have eight Seaside Awards in the Fylde Coast. That improvement in water quality is phenomenal and if you visit Blackpool you can visibly see the difference. When you look out over the Irish Sea you will see that our coastline is significantly bluer to the eye and for the last few years we’ve attracted more marine wildlife than I can ever remember, with dolphins and porpoises the latest in our long line of visitors to the resort. This isn’t a one off either, work continues to reduce pollution , early water quality samples for this year are looking good and hopes are high that our sea water will continue to improve again this summer - despite the early summer rain - meaning that more Blue Flags could be flying across the Fylde coast very soon.